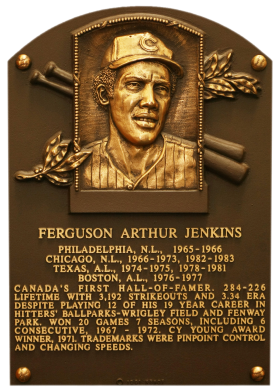 After being traded from the Phillies to the Cubs in early 1966, Jenkins embarked on a string of six consecutive 20-plus win seasons. 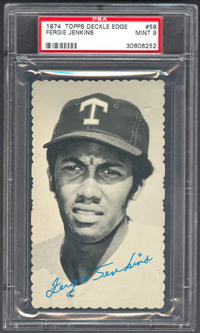 He won only 14 in 1973 and was traded to Texas, where he won the 1974 Cy Young Award with a 25-12 record. 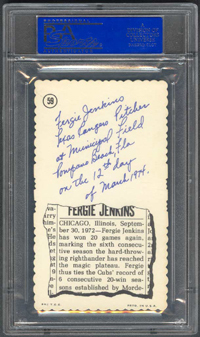 One of the game's most durable pitchers, Jenkins had a career 284-226 record, with a 3.34 ERA and 3,192 Ks. 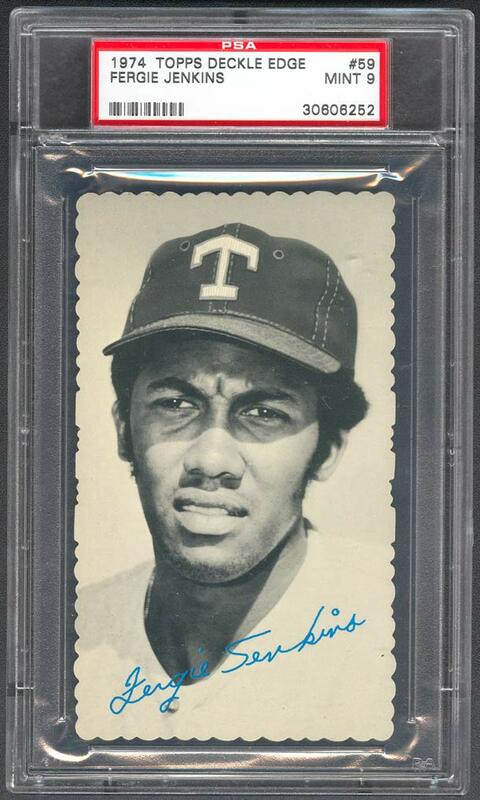 Comments: I first purchased a 1974 Topps PSA 8 in August, 2002 but never liked the card. Honestly, the expression Fergie has on his face isn't very flattering. So, I looked for a replacement. In March, 2003 I won an eBay auction for a PSA 8 Deckle Edge -great card, love the gloss. And, a year later in June, 2004 I found a PSA 9 upgrade via another eBay auction from seller Bob Kaiser. Description: These borderless 2-7/8" X 5" cards feature a black-and-white photograph with a blue facsimile autograph on the front. 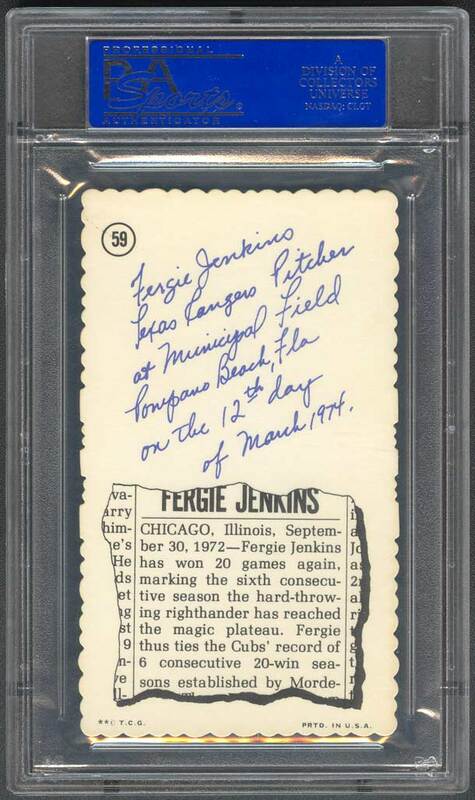 The backs have in handwritten script the player's name, team, position and the date and location of the picture. Below is a mock newspaper clipping providing a detail from the player's career. Backs can be found in either gray or white (somewhat scarcer). The cards take their names from their specialty cut edges whic give them a scalloped appearance. The 72-card set was a test issue and received rather limited distribution around Massachusetts. 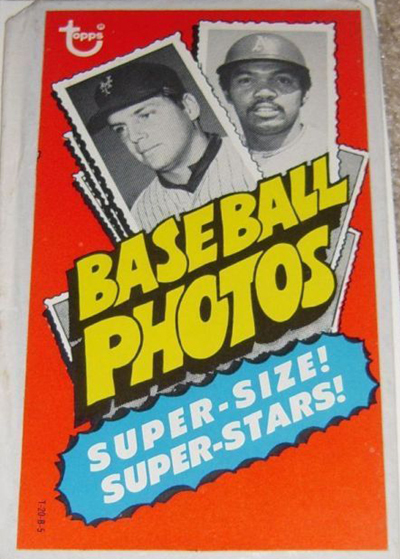 The cards were sold three per pack for five cents with a piece of gum, or in two-card pack with no gum. Proof versions with straight edges and white or gray backs are known; they are slightly larger, at about 3-1/8" X 5-1/4".